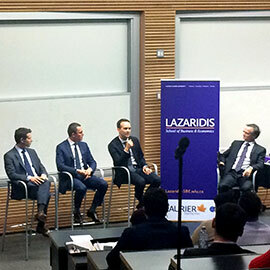 Three Lazaridis School alumni returned to Laurier’s Waterloo campus on Nov. 10 to share their insights and experiences from working in the investment world. Portfolio managers Steve MacMillan (BBA ‘00) and Joe Overdevest (BBA ‘02), and Assistant Portfolio Manager Connor Gordon (BA ‘09) sat on a panel moderated by Finance Professor Brian Smith to detail their journeys from undergraduate finance students to successful investment professionals at Fidelity Investments Canada. “As a young child, I was dominant in monopoly,” said MacMillan. “I wanted to parlay that into a career.” He joined Fidelity in 2008 after working as a portfolio manager for KBSH Capital Management and is currently focused on U.S. equities and small caps. MacMillan acknowledged that the market is difficult to beat – it’s about relative, not absolute, skill so confidence is important. He also explained that as portfolio manager, it’s key to make use of whatever unique resources or knowledge available that may give you a competitive edge. “Laurier has some of the best business technical training anywhere,” said Gordon, who joined Fidelity in 2009 following two summer internships with Team Canada. “With hindsight, I wouldn’t trade that for the world.” Now focused on U.S. equities and global exposure, he was quick to point out the real investing opportunities available to students, such as the Laurier Student Investment Fund, which manages a portfolio of approximately $850,000. All three panelists stressed that this type of career involves high pressure, long hours and a lot of reading, but doing so can lead to a career that is quite intellectually stimulating. MacMillan, Overdevest and Gordon also highlighted there are a number of different roles in the investment industry, as not everyone can or is best suited to be a portfolio manager. Along with talking about how they made the transition from student life to corporate life, they answered questions about their industry knowledge and perspectives on the markets to what Fidelity looks for when hiring. Following the panel, Fidelity hosted a networking reception for students in Lazaridis Hall to connect with managers and senior leadership in attendance and learn more about future employment opportunities. Fidelity Investments Canada is part of the Boston-based Fidelity, the fourth largest mutual fund and financial services group in the world with assets under management exceeding $2 trillion.